I bought the Philips HP6513 Rechargeable Epilator after looking and testing out quite a few others in the market. For many years, I have used the razor to remove hair on my legs and tweezers to remove hairs in my armpit. However, these always gave me bumps with ingrown hairs and chicken skin. though it might seem costly, I can say it’s worth every dollar! I just glide the epilator up one of my legs and feel a slight prickling pain, but I can actually see the leg hairs are instantly plucked wherever the epilator goes. There is an ice pack included in the kit and I usually leave it in the refrigerator and just attach to the epilator whenever I need to pluck fine little hairs to numb the pain. I use it for more sensitive areas to make epilating more bearable. It is not pain-free but compared to waxing, I think this one is more tolerable. I’m far from a socket. I just charge it and then unplug and use it in the bathroom. It only lasts for about 20 minutes, so there’s a need for batteries with longer lives too. or else the epilator can’t get it. I’m still hoping they come up with one that can get even the shortest hairs. But for now, since it doesn’t cause me to bleed, have nicks, chicken skin, or ingrown hair, I still highly recommend this. 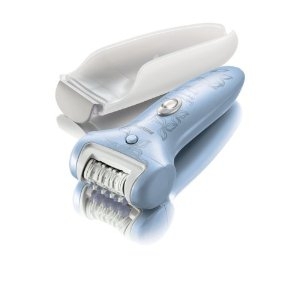 As the epilator also pulls hair from the roots, so it takes longer, maybe a week or two to grow back. And for that time, feel free to wear shorts, skirts and cute dresses!